We’ve been talking about little things you can do that make a big difference in the results you get from your marketing. After all, it’s amazing what triggers someone to buy now and what stops others from buying at all. 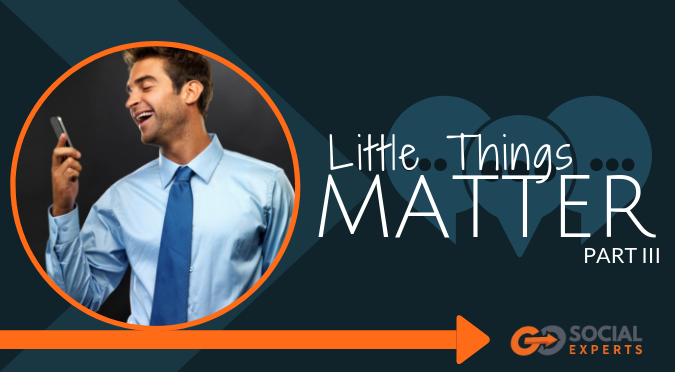 We’ve put together a list of some online “Little Things” that matter and if you’d like to download it, Click Here to get it. Now, what do I mean by the tone of the message? All of us write and talk in a certain way. Some are funny, others serious, some are friendly, others are more business-like, others formal, and still some are casual, and so on. As you can see there are many different tones people use to communicate with their audience. And you’re going to want to consider which of these you’re using and when you’re using them. After when talking to family and friends you use different tones in different situations, and to be effective in business settings you will want to be using different tones in different situations. All of us have styles of communication and tones we use that are more comfortable for us than others, so we tend to default to these. That’s not a problem unless it’s not one that fits our message and our audience. Be aware of how you’re sounding to your readers on your web page and in any message you send. One other thing to consider is whether or not your messaging and tone are consistent across all of your emails, websites, social media, etc. You want to make sure that your tone is consistent across the different methods you use to communicate with your audience. After all, if you have a formal website and you’re sending friendly, casual messages, your audience is going to be confused. A confused mind doesn’t buy. Now, what about methods of communication? How are you following up with your audience? As I’ve stated before, the money is made in the follow-up. Unless you’re selling a very low-cost item or service most people won’t buy the first time they encounter you. Do you send emails, Facebook messages, text messages, phone calls, postcards or letters or…? There are endless ways to follow up with your audience, but which do they respond to, and which fits your tone? If you have a formal website and are conservative, my guess is your audience wouldn’t respond well to a Facebook message. That is a more intimate and friendly method of communication than email or a phone call. You can use any of the listed methods or one of many others. The goal is to find which method will enhance your message and get you the results you’re looking for. As you can see there is much to consider with these ‘Little Things”. While they appear little to the outsider, to you they can mean the difference between your marketing ending up an expense or a profit center.